WITH PROFOUND APPRECIATION TO DEBORAH STEVENS ORGILL FOR THE OUTSTANDING WORK, TIME AND DEDICATION GIVEN TO THIS LONG TRANSCRIPTION. Thank you so much. I am so thrilled and pleased with what the Lord has ordained for such a time as this and excuse this I can’t see any of you without blocking the light. I never felt comfortable in the lime light anyway. I’m here to tell you that the Lord is here and my Mama always taught me and said you must decrease for Him to increase. Every meeting I would go to she would pray over me, as I was leaving she’d say, “Son, you just be as little as you can be and God will be just as big as He can be.” So I come to you tonight in weakness, but the Lord’s strength is what we’re looking for, the impartation of His strength. And if I can do no more than groan in the Spirit, it’ll accomplish more than all the beautiful words the auditory put together. I am really just so glad to be here. Someone said at your age and condition you should be glad to be anywhere (laughter). but I’m specially glad to be here. My mother was a very humorous person and I think she passed what humour she had along to me. I can’t tell you how thrilled I was to see the receptivity, no resistance, I couldn’t feel any amount of resistance in this meeting last night. The speakers today were on fire and that just pleased me so much. Paul Mannering…Man Warring I guess I pronounce it. Man Warring…and it looks like he won the war. And Doctor Glass, I hear that the Lord was mighty, used him mightily today. It just really thrilled my heart to think we heard from God and obeyed the Lord and here we are in a most history making meeting probably in many decades. We prayed it would be greater than 1907, the results, when the results are finally in we’re going to look back on this meeting, those of us who are still alive , and say I was there and God was moved in and anointed in a mighty way and He’s here tonight to confirm ministries and do mighty things. I was just hoping in some way, this young doctor who led me to the platform, I understand he’s the son in law of brother Ken and Lois Gott and he came to visit me today. Someone said you’re always having health issues, health problems and they’re critical of that and in America a prayer request will go out and say Paul Cain needs prayer and then the response is, “How bad is he this time?” Very heart warming. Well, anyway, I think I had the battle of my life this morning. So brother and sister Ken and Lois sent their son in law, who is an accomplished, I guess sounds like, a world class physician, already retired, can you imagine that, if I had the finances I would just invite him and his family to travel with me and help me. He told me things that only one other specialist I ever met told me and so he really is an intelligent, accomplished doctor. Well I didn’t come to preach tonight, I just came to talk about how God really established you in the meeting last night and we will see the results of it on the years to come. I want you to pray that I will live to see at least some of the benefits from this meeting. (Applause) I want to with all my heart. Now one of the things that happens to me without the anointing, where my memory is involved and without the Lord illumining my mind, sometimes I don’t know where I am. This morning I had an experience where I thought it was the end and my life, I didn’t know where I was, I didn’t know who I was and I didn’t know if someone else was in the next room. It was probably the most unusual experience and the enemy said, “Well, you’re not going to live through this meeting.” Well now that bothers me. Wouldn’t it bother you? Well of course the devil is a liar, always has been from the beginning so I have to remind him of that. He always knows it, but we have to remind the devil who the devil is. How many of you would like to get to the point where you just scare the devil out of the devil? Wouldn’t that be wonderful! I’m not preaching tonight as you can tell, but I’m going to share a few things with you. I just wanted to tell you that I was breathe struck when I was told that Doctor Colin Dye and his wonderful wife Amanda had gone back today and I thought, “Oh I won’t get to tell them what’s on my heart for them|” and when I found them here tonight it just really blessed my heart. 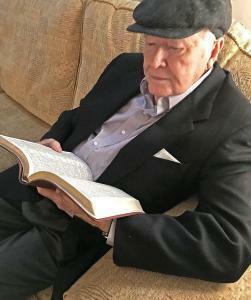 I don’t know when I’ve met anyone who has challenged me to really go on to know the Lord, as Hosea said, as much as brother Ken and Lois Gott, They’re just regal people to me, very wonderful charged vessels of God and who else would the Lord call to host the beginning of a revival like this. You know I had an assistant that lasted for 20 years, he and his wife when they first met me, they were just newly married and they sent me a card, a greeting card and they said we don’t love you for what you’ve got we love you for who you are, but what you got ain’t bad either. So with the Gott’s I thought of something a little humorous today. I was telling Danny, the Gott’s have ‘got it, the Gott’s have ‘got it’, can’t remember the rest. You that have discernment can laugh and you that don’t just forget I said it. So anyway I wanted to mention people tonight if I possibly could. I have a representative here for many years n the meeting and he and his wife have been such wonderful friends and that’s Jon and Kerry Cressey. I’m just so glad they are here, that they represent the Paul Cain Ministry of the UN, I mean the UK. I really appreciate them being here. I appreciate the hostages, I mean the hosts that they’ve been to us given and taken care of us. They’ve been absolutely wonderful. Well I know there’s someone I’m going to leave out. I know there’s a young man here tonight, an older man now who is married and he was in the meeting in Anaheim California when I first gave the visions of the stadiums and that meeting was accompanied by such awesome power that something tangible, something you could feel knocked out a $50,000 camera and the phone systems and someone said that can happen because of the current in the AC, the electrical current, but what was strange about it, it was all battery operated equipment and all of that burned because of the power of God that was in that place. I don’t know whether I told you last night about, we had a meeting in Olathe, Kansas, near Kansas City, Missouri, on the Kansas side and the glory of God came to the degree that the fire alarm was set off at the fire station and here are all these fire trucks and fireman came in and the power and the presence of God was so strong that it was so disruptive to see them walk in with their yellow jackets and hats, axe in their hand. ” Where’s the fire? Where’s the fire? Fire alarm, fire signal….Well when the glory of God comes it messes up with, gets mixed up with the what is real in the flesh and what’s real in the natural mind because the natural mind can’t discern the things of God. How many of you know that there were people in this meeting last night, you were here, you believe that the first match was struck, that God was going to strike the first match for revival? Amen. I believe that with all my heart. This is something I wanted to speak about tomorrow, but I feel like there are people here tonight that God wants to hear this and you may not be in the meeting tomorrow so I’d like to just give you my thoughts, then pray for you and see what The Lord has in store for us tonight. “But the Lord had laid on my heart just to talk about discipleship tonight. In Luke 9:23 it is written the real meaning and a real principle of discipleship and you can take a note, I want you to read this when you have time. It speaks of discipleship. I believe it is a journey. For many years we had a television programme in America that was really blessed and it was entitled,” The Class of 33AD.” It was all about discipleship. So I think that’s what Luke 9:23is all about. 1. What we leave behind. 2. What we take with us. 3. The path we follow. So of course what we leave behind in Luke 9:23 is ourself; we leave self behind. What we take with us; we take up our cross daily and the path we follow is in His steps. We follow the Lord. That’s the most wonderful illustration of discipleship that I could ever imagine. So I want you to think of yourself in the future journey that’s ahead of us to leave something behind and what we leave behind is of course yourself. You know everytime I go on a trip I prepare to take something with me and always leave something behind and what you leave behind in discipleship, you leave behind yourself. And what you take with you, you take up your cross daily and follow him in His steps. There is no reason to ever get out of sync or ever be distracted as long as you keep your eyes on Jesus. How many think it’s important to keep your eyes on Jesus? “Looking onto Him the author and finisher of our faith.” We need to keep our eyes on the Lord. I could see in this vision for discipleship in Luke 9:23, the Lord leading us. If you’re following the Lord you need to keep your eyes on Jesus and He’s the one that’s head of the group and if you don’t keep your eyes on Him, the Lord may turn a corner and you have your eyes now on number 13 and he goes right on in another direction and you’ve missed the Lord altogether. Wouldn’t that be sad. Watch the Lord and which way He goes and don’t follow after another, because you’ll wind up in all kinds of weirdness and doctrines that are even of devils. Keep your eyes on the Lord Jesus Christ and that’s what’s important in this last day revival, is for you to keep your eye on the Lord at all times and to do what He does and follow in his step, then you’re going to be involved in revival beyond your fondest dreams. Supernatural revival, the healing of the sick and the raising of the dead. Before I came here, every time I would look at Lois on the Facebook page. I would see all these children and I saw one in particular and it turns out his name is Elijah and the Lord showed me, I told his father today, that the Lord showed me that he was a future prophet and that he was going to be used, before I ever knew his name was Elijah. Before anyone ever told me anything about it, I was going to ask Ken and Lois about this young man. he said, “I hold in my hand on the head of a future prophet to the nations.” You know that didn’t mean so much to me till later when I found out that the Lord appeared to my Mom at my birth and told her she’d live and not die, when she’s dying with the cancerous tumours in her womb and cancers that had eaten both breasts away and mutilated her and destroyed her breasts and her heart trouble and tuberculosis in both lungs. Now my mother was given up to die long before my birth and she went to Baylor University Hospital for help. They told her she was dying and never would live for the time for me to be born. How many of you believe I’ve been born? Well I’ve been born you know for all these years. It seems like all my life I’ve loved the Lord. Never has been a time in my life when I didn’t love the Lord. I’ve never turned away from Him and I’ve followed Him on a discipleship journey and it looks like it’s going to pay off in innumerable dividends right form this meeting here. God is going to raise up young prophets and apostles and evangelists and teachers and pastors from these meetings to go into all the world and preach the gospel of Jesus Christ. But I just come and I just tell you these simple little truths. Turn your eyes upon Jesus. Keep your eyes focussed on Him. You know it used to be our theme song in the meetings. I was staying in a home for elderly women, they had a prophets chamber there, when I was at Calvary Temple in Los Angeles for meetings and there was a lady there that had written a song and it turned out to be Mother Lidden and she wrote this song, “Turn your eyes upon Jesus. Look full in His wonderful face and the things of earth will grow strangely dim as we see His glory and behold His grace. Let’s keep our eyes on the Lord. Don’t ever allow yourself to focus on number 13 or you’ll be ruined. You’ll be tainted. You’ll be absolutely out, out of step with what God is doing in these last days. Don’t you want to be in on the greatest event in history? Don’t you want to think that we maybe the very generation that will see the Lord split the eastern skies of Glory and come to earth to catch His bride away? Listen! All things will disappear. There’s been some songs. I used this phrase quite a bit lately because it’s the winter of my life and when something warms the winter of my life it thrills me and when I heard from Dr. Colin Dye the other day, he wrote something that i just said to him, ” You’ve just warmed the heart of an old man in the winter of his life.” Well I want you to know in the winter of my life right now, the greatest thing i could ever hope for is to know that last night a fire was lit. Last night something just as significant as the beginning of any move of God or revival of the past, may go beyond it and upstage it greatly and it happened last night. How honoured we are just to be here with each of you and to the speakers, the leaders of this meeting. I’ll never be the same again. I’ve had faith to go through all I know I had to go through to get to the end of the way. How many of you still want to be a disciple? You still want to follow the Lord? You still want to look to him the author and finisher of our faith. Not long ago I was in North Carolina. I was in a walk out basement of a beautiful home there, staying with some wonderful people. I was there by myself and I was looking out of these sliding glass doors and it was night time outside, but i actually had a vision and didn’t know what was going on. But I had a vision of the host of heaven and I saw my mother and everyone in that host looked exactly alike and I thought, ” How in the world will I recognise my mother and my loved ones?” And I knew my mother out of that great host of vast numbers of people and I said, “How can this be Lord?” And so He said, ” Well you will be known as you are known.” Won’t that be wonderful! To be in heaven and know as you are known. I mean you’ll know everything , everybody as you are known. Well say something. Amen! Don’t you look forward to that? Now I do look forward to that and heaven’s my home, but I’m not home sick tonight. I really want to live to see what you’re going to see. I really want to live to see young men and women excel for God. Heal the sick and raise the dead and I haven’t lost the fire I had when I was a very young preacher. I said, “Paul, you didn’t tell her?” And I walked over in front of the divan and I said, “Lady we’re here to raise your husband from the dead.” And she shot straight up from that couch and looked at me and fainted. So here we’re patting her little hand trying to bring her back around, so when she did come back around she said,”Did I understand you right? Did you say you were here to raise my husband?” She said, ” Please don’t! You wouldn’t do that would you? Please don’t! I wouldn’t have him back for anything!” (laughter). So that’s the closest we ever came to raising the dead from that time. You know it’s going to take that kind of child like faith in this discipleship journey. We’re going to have to be able to trust God for anything. I don’t know how we’re going to get rid of this carnal brain of ours and see the dead raised in these last days. It’s going to be a revival so great that the dead will be raised. That’s the kind of thing you’ve signed up for whether you realise it or not. Amen. Amen! We have some people here from the States, that have come all the way over here and why do you think they did that? Because they really believed that God was going to visit Sunderland, and that it was going to be unprecedented and that’s what we talked about last night. I’m not going to speak a long time tonight, but i just want you to know that we need the dead raising faith to see this revival to go the way God wants it. We need to go about everyday in this discipleship journey telling the righteous it shall be well with you. We need to heal the sick, raise the dead, cast out devils. That’s what the church is all about in these days. Let’s believe on His name. By the name of the Lord the lost will be saved, the sick will be healed. By the name of the Lord, the lost will be saved by scores and everywhere you go you’re going to be a soul saving instrument for God in the last days. Hallelujah! Hallelujah! Hallelujah! Hallelujah! Hallelujah! Let’s all strike some matches tonight, for revival has come in the name of the Saviour, in the name of the deliverer of the world. The Lord Jesus Christ has come to our hearts again. Although, we’ve gone astray in the past and we’ve settled for things that didn’t last, but let’s go all the way, let’s pick up our cross, take up our cross, let’s walk, let’s follow Him wheresoever the Holy spirit leads us. We’ll see the signs and wonders above any imagination, beyond any thought, beyond any belief. Let’s go for broke. Let’s go for the whole 9 yards. Let’s go for the whole thing. Amen! Amen! Will you stand with me and just say “Come Lord Jesus.” As John Wimber used to say, “Come Holy Spirit.” Lord Jesus come. Come to your people tonight. Fill them. Fill them. Fill them with the Holy Spirit Lord. Let it flow through us. Let it emanate from our being. Let the light shine above the brightness of the sun. In Jesus name. Revival! Revival Lord! Let the first fires of revival start here for the end time, in Jesus name. Now one of the things the Lord has laid on my heart tonight is for the young. This thing with the doctor today, I told him about his son, that the Lord has shown me he was going to be used of God greatly and the young man needs to be protected. He needs to be watched over, prayed over , tutored and guided by Holy Spirit. And Elijah inspired me no end and I said , ” Lord what do you want to do tonight?” Knowing my weak vessel I can’t do anything in myself. I’m just at the point right now where God can use me because I can’t use myself. I’m not able to do anything in a self centered way. I can only depend on Him to keep me alive with what I’m doing right now. I’m 88 going on 120. Well I want you to know tonight we have the mind for Christ. These young people are coming forward. You’re certainly candidates. You certainly can be equipped for the last day ministry. Isn’t it wonderful! Oh Lord, let the spirit of Elijah come! Let the spirit of Elijah come in Jesus name. Thank you for that Lord. Amen . Oh my! Lord please move upon every one of these young people, no matter what age they are. I pray you will baptise then with the Holy Ghost. Lord baptise them with every gift. Lord give them the gift of discernment, the gift of healing, the gift of miracles, Lord every gift available. Lord give these young people their marching orders tonight. Give them their anointing tonight, so that they can leave from this meeting with the glory of God upon them and so that they can walk behind you all the rest of the way and follow you in this discipleship journey Lord. Oh God, let us keep our eyes ever upon you Lord Jesus Christ. Lord send your angels to lift these young people up lest they dash their foot against a stone. Everyone that stands before you tonight, I declare and decree that they’ll never fall. I pray they’ll never fall into sin or into sexual problems or into any kind of immorality Lord. Keep them! Keep them from falling. Lord keep them. Hold them with the right hand of your righteousness. Lift them up lest their feet may dash against a stone. Oh Lord, carry them all the way through the rest of this journey. Help them be evangelists for you. Help them be prophets for you. Help them to be discerning of spirits for you Lord. Help them with discernments and words of knowledge and everything you have to equip your people with. Equip the young saints here tonight Lord. Equip them with your power, your anointing. May their tongues be tongues of fire. May their words pierce through the hardest criminal and through the hardest heart. Let them be your salvation evangelists. Let them be your healing evangelists. Let them be your word prophets and what they speak will come to pass. Lord let things come to pass not many days hence from this night. Let the glory of God come upon both young and old. Bless all of us no matter what ages we are. Let your power, let your glory, let your victory come. Unprecedented unity coming to the church. Oh my! You young people are commissioned tonight. In the name of Jesus such as I have I give to you. If I have anything, if I have anything that has been worthwhile from God, I give it to you. The Lord has given me the ability to give it away. To give it away! I might not be here much longer, but I’m here to give it away. Whatever God has given me through these many years of ministry, I give it to every young person. I give it to old and young and Lord may they take it up and may they use it and may it be for your glory. May they go beyond anything any healing evangelist has ever done, anything I’ve ever done, ever thought I might do. Let it happen to them! Lord this is a baptism of your love, a baptism of your power, a baptism of your fire, a baptism of your glory. Lord you’re gong to bring unity to the church through these young people. I commission them to live in faith and walk in faith and purity the rest of their lives. May they be ‘way showers’. May they show us the way. May they show others the way. To the glory of God unprecedented in Jesus name. But I just see for the UK that your churches are going to be on fire. Your churches are going to be attractive and people are going to watch you come and burn. They are going to come and see the glory of God and the fire of God and the anointing of God and it’s going to stay with you and you’re going to know how to nurture it and you’re going to know how to keep it. It’s not going to be a passing thing like the Welsh Revival or Brother Roberts, bless his heart, Evan Roberts, that was one of the greatest moves of God this nation has ever seen, yet it was not nurtured, it was not kept by the right keepers. They didn’t know how to to do it. We know how to do it! Don’t we! We’re going to follow Him. Follow Him. Wherever the Lamb leads us we’ll follow Him. Wherever He goes. I don’t know whether you can feel it or not, I get going about feeling all the way, but there’s something you can realise here tonight, I tell you some of these young people up here tonight close, I felt the the power of God surging through your being, through your body and this couple of brothers here they can’t turn it loose. Something got ahold of them and they can’t turn loose. And I want something to get ahold of both old and young that you can’t turn loose and that won’t turn you loose because you don’t want it to turn you loose. The love of God is multiplied here tonight. The power of God is multiplied here tonight and in every increasing way tonight the power of God is all over this audience. This is what we’ve come for. This is what we’ve prayed for. This is what we’ve longed for ever since the last time the Lord said in 2017, “I’m going to send revival to them.” Alright now Elim, let it go over your walls and let it pour out over the Assemblies of God. Let it pour out over the Baptists, the Methodists, the Presbyterians, the Catholics and all flesh. All flesh will know that something happened on this day that was prophesied 30 years ago. Thank God! How could we ever forget. Now just extend your hand to these young people here. Father let them be anointed from the top of their head to the tip of their extremities. Flow through them Holy Spirit and let them bring revival everywhere they go. Everywhere the soles of their feet have trod, let revival come and let the power of God, let the power of God fall on old and young, both small and great all through this place. Let it be known on this date, on this particular time, at this exact time the power of Almighty God fell. The power of Almighty God and His Christ. Oh Lord, we’ll never forget what you did in Sunderland this night for the very young and the old. Let’s all stand. Let’s all praise Him and accept whatever the Lord is giving to the young people. Let it resonate in you. Let it come upon you and the Spirit of the Lord shall come upon you and you’ll be turned into another man or another woman before you get out of this place tonight. The Spirit of the Lord coming upon you. The Spirit of Truth. The Spirit of Wisdom. The Spirit of unity, of power and of a sound mind comes upon everyone in this room. You’re privileged to be here. The power of God has put His stamp of approval on this gathering and we’re all gathered in one place and suddenly the Holy Spirit has come, almost like a mighty rushing wind and cloven tongues as like of a fire are on some of you. The spirit of discipleship is on every one of you. You’ll leave here not being the same, ever being the same again. For God is with you. He’s with your children. He’s with those you represent at home, far off and as many as the Lord our God shall call. Let’s praise Him for that and thank Him for that right now. Listen while I’m under the anointing I want to pray for Colin and Amanda and i want everyone else to be blessed as well, but there seems to be those who God had called for specific things in the body of Christ for these last days. And I feel that way about Colin and Amanda Dye, I feel that way about Ken and Lois Gott and I feel that way about many of you and Jon and Kerry Cressey. All of you and the wonderful people who have taken care of us. But all of you. This is an all inclusive thing. God is not just speaking to a handful of people. Everyone here has been graced by the touch of the hand of God. Everyone! The fire of the Holy Spirit has come upon everyone here and when you leave you’re not going to be the same again, no matter how much you try. You’ll never be the same again. I prophesy that no-one in this building will ever be the same again. It’s for you and your children and for them that are far off, to as many as the Lord our God shall call. A significant thing. A significant voice has come and spoken and God has revealed Himself in a new and living way in every one of us. So Lord I just pray that the anointing will come upon Colin and Amanda. Lord the church that has had the most history of Smith Wigglesworth and the revivals of the past, Lord I pray that the Welsh Revival and all would be upstaged in this meeting. But anoint them Lord and let their days be greater than anything that they’ve experienced in the past. We’re making some strides forward tonight. God, the Holy Spirit, has come to make great strides forward for your path. Let’s walk in His path, follow after him to know Him and Lord I’ll just pray this blessing for everyone. It’s a vision I’ve seen before. In a vision praying for Colin and his wife and for others. Oh God, don’t let this escape the minds , the hearts, the experience that you’re sending tonight. Don’t let it ever escape any of us. In Jesus name. In Jesus name. Let everyone stretch their hands out towards the youth that have come forward tonight. It’s the most glorious thing He’s done, He’s done for the youth and then it’s overflowing to both young and old. I want to pray for the leaders of the conference and the speakers of course, this requires a reciprocal action. I want you to pray for me too because the enemy has already planned to make sure I pay for this. But it’s worth it. It’s worth it. I told Lois, God, in an email, that this meeting’s the most important ‘cos I’m giving my life, it’s costing me my life. It really is costing me my life. I don’t mean that I’m going to expire or anything ‘cos I’m too inspired to expire, but let me tell you this meeting has cost something and God has rewarded those who have prayed for these years. God has rewarded you and the effort you put forth to come here. Look what God has done for us! It’s wonderful! Now Lord I pray for the sick. I pray for….. Lord I want you to please heal Lois tonight. Just move up and down that spine and her back and Lord bless Ken and Lord give them strength, not just for the day, but also for the rest of the way. And all of you, both young and old, I pray you will bring healing power. Let your healing waters flow on all of these and let them go away saying, “We’ve never seen it on this fashion before. We’ve never felt the depth or the power to this degree before.” Let them be able to exclaim that. And Lord I pray that the power will rest upon them for the rest of days of their life and they’ll dwell in the house of the Lord forever. Thank you Lord. There’s a number of people here with cancer, hanging on. Lord we pray that, that cancer will die, die at the roots and fall from their bodies and be passed from their bodies and Lord from the crown of their head to the tips of their extremities, I pray the arthritis, sickness and diabetes and blood disease, every kind of cripple condition, everything that caused it Lord will be dealt with tonight. Let people go their way saying, ” We really have never seen it on this fashion before. Surely God was there!” And you are here and we thank you Lord for showing up in this meeting of all meetings and I thank you Lord we’ll never be the same again, going right on to the end of the way with the power to witness. The power to have well bodies and strength and health and vitality to go all the way to the end of this age and the end of this time when you shall appear. Oh Lord, and all fear, all fear will be wiped away. Oh Lord, you came again to us. In Jesus name. It’s been worth it all and it will be worth it all from this point on. When we see Jesus, one glimpse of your dear face, all sorrow will erase and how bravely we’ll run the race from this night on. How bravely we’ll run the race until we see you Lord Jesus Christ. Amen. The Lord bless you.